Story: You've been enlisted to a secret organisation and must undergo a training programme which involves shooting robots with Nerf guns. Score higher than the other candidates in all the tests and you're in. 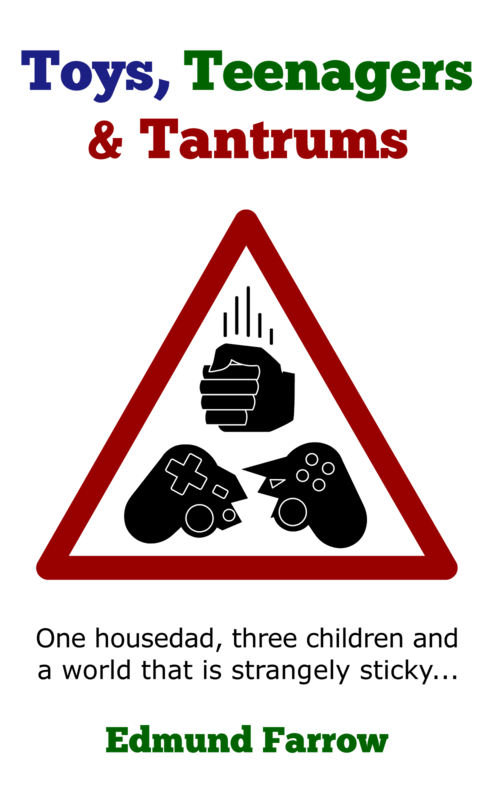 Gameplay: Point the wiimote at the screen to aim a cursor. Press B to shoot. There are around twenty different tests, about a third of which are shooting gallery challenges - shoot all the red robots as they appear, for instance, or hold off an onslaught of robots flying towards you in waves. There are also three standard lightgun game sections where you traipse automatically through grey corridors, firing on any robots which show up. Some of the tests are much more imaginative, though, requiring such things as knocking balls into goals. The best bits are the block challenges which mimic BOOM BLOX - hit various blocks off a platform without dislodging the gold ones or blast a path clear to a goal block through a tower of other blocks. Save System: Automatic save after each event. Comments: Every so often I get sent stuff to review. Some of it is obviously brilliant, other stuff takes a while to grow on me but seldom am I presented with anything where my initial reaction is to view it as a work of genius. No wonder he was worried. 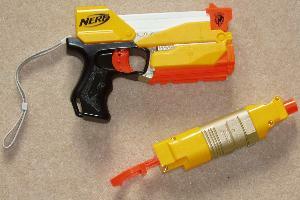 It's a plastic gun which fires foam darts. With the press of a button, the dart mechanism can be removed and replaced with a wiimote (not included!). It's both a fully-functioning Nerf gun and a computer game controller. Genius! Someone somewhere is either very clever or getting a ten-year-old boy to design products for them (or possibly both). The gun with the firing mechanism removed and a wiimote inserted. Surprisingly, the Wii game that comes bundled with the gun isn't the complete pile of steaming nappies you might expect. The developers were obviously given a budget of tuppence but they've applied some imagination to make up for the limited options and bland graphics. The block shooting tasks in particular are a great idea and require some thought as well as accuracy. Overall there's a good mix of things to do and the game is fun and seldom frustrating. Sadly, having to sit around shooting endless waves of robots in a warehouse isn't so good. Also, the bits where Nerf N-Strike mimics typical lightgun games, guiding you along corridors while you target enemies, are functional rather than inspired. The main problem, however, is that the single player game is very brief. It can be completed in under three hours (although unlocking all the weapons and gaining gold medals in every event will take longer). Adding proper high-score charts and more levels to the challenges would have taken little effort, so it's a shame they weren't included. Multiplayer is where the longevity lies. Most of the tests can be played by four people simultaneously competing for the highest score. Up to ten events can be queued up to create a tournament with points awarded for player position in each round. Some of the events are absolute mayhem and they have the advantage of being easy to explain. Anyone with even the most basic knowledge of a wiimote can be ready to play in the time it takes for an event to load. If you've got visitors (whether adults or children), this is a great way to pass half an hour. 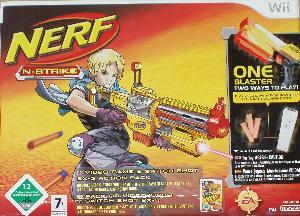 Of course, if you're trying to decide between this and the technicolor zombie blasting of House of the Dead: Overkill then you're really not going to opt for Nerf N-Strike. For children, the competition is much more limited. Nerf N-Strike isn't as polished as Link's Crossbow Training but it's less frustrating and has multiplayer. 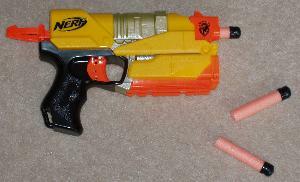 Also, it comes with a Nerf gun. Conclusion: Feels like some training levels looking for a proper game to be part of. It's still fun, nonetheless, and has a riotous 4-way multiplayer which sure as heck beats playing Wii Bowling again. Graphics: Grey arenas, corridors, rooms and warehouses. A handful of robots. Lots and lots of different Nerf guns.